Chemical Labelling: Achieving Perfect Chemistry in the Supply Chain. Chemical labelling compliance is a challenge faced by many companies in a wide range of industries. The struggle to provide GHS compliant warning labels and safety data sheets (SDSs), in both local and global markets is an ongoing concern. The globalisation of the specialty chemicals market has opened up a number of opportunities for the supply chain. More chemicals are being transported around the world than ever before, with demand for products shifting beyond the traditional markets like Europe and North America meaning customers are now spread over a wider area internationally. Add to this, increasingly stringent regulation, and the need for effective supply chain management becomes imperative. With the growth of emerging markets, and an increased number of companies choosing to outsource their manufacturing throughout the development stage, speciality chemicals are being shipped around the world at a greater frequency. The worldwide chemicals market is growing exponentially. In fact, the market for chemical products is expected to grow to some 5.6 trillion euros by 2035, more than doubling its current size. North American, Western European and Japanese speciality chemicals producers have begun to establish manufacturing facilities in Asia and elsewhere where labour costs remain low; while access to cheap raw materials is driving the market towards the Middle East. Chinese and Indian manufacturers are also becoming key players in the speciality chemical markets as the shift towards a truly global market continues. These factors all point to greatly expanded supply chains for the transportation of speciality chemicals, requiring complex logistics and strict adherence to legislation on both labelling and documentation. Companies investing millions in the development of chemical products cannot afford to jeopardise their investment through shipping delays. Import licencing and other entry requirements of non-Western countries call for specialist knowledge, and speciality chemicals, in particular, require a temperature controlled supply chain, supported by labelling that meets the relevant legislation. Chemical classification that highlights the intrinsic hazard of a substance is a fundamental part of its safe management, handling and use. Getting the correct product to the desired location at the right time while controlling costs is a challenging job for any haulier. Add to the mix, the fact that chemical products are often corrosive, combustible, temperature-sensitive, poisonous or otherwise dangerous to employees and the environment, and the task grows even tougher. With this risk in mind, chemical legislation is increasingly becoming a necessity for company’s looking to ship products globally. Legislation has many objectives, namely ensuring the safety of people throughout the supply chain as well as the environment, but also carries with it key challenges. Due to its inherent risks to human health, the development of speciality chemicals is subject to regulatory control at every stage, and this compliance requirement is especially evident in the supply chain. Key to this regulatory compliance is chemical labelling, with complex legislation surrounding the movement of chemicals particularly important to the industry. If mishandled, hazardous chemicals can be extremely harmful for those coming into contact with them during transit. Incorrect, missing or insufficient labelling of packaging, as well as the chemical containers themselves, can have potentially dangerous consequences, while difficult to read labels, which have been damaged during transit, can also lead to further risks during handling. With the breadth and reach of international trade continuing to increase, the system of labelling has become increasingly complex and often dangerously misleading as people from different countries, speaking many different languages, come into contact with shipments of potentially hazardous chemicals. To guarantee a universal system of labelling, which is understandable to all, the United Nations has created the Globally Harmonised System of Classification (UN GHS). CLP is the European Union’s legislation to underpin the new system, and it uses the UN GHS as its base for the Classification, Labelling and Packaging – hence the name – of substances across all EU countries. The aim of the GHS is to apply the same criteria for categorising chemicals worldwide, according to their health, environmental and physical hazards, and the subsequent requirements for chemical labelling and safety data sheets. The size of labels, types of supplemental information and precise position of data on the label, are all covered under the CLP rulings. Companies now have to follow strict adherence to these guidelines to ensure they are fully compliant within the remit of the new CLP system. There are new hazard warning labels and guidelines around the use of words, phrases and terms. The dangerous goods list also has several changes and there are alterations to packing instructions with some specific to the method of transportation. On the road specifically, legislation on the construction of vehicles has been amended and there are new EN and ISO standards. The new legislation aims for simplicity and accuracy in labelling but the definitions themselves are complex so seeking advice from industry experts is advisable. When commissioning labels, consideration should be given to the heat and humidity they will be expected to withstand and what their life cycle will involve – a factor particularly relevant in the speciality chemicals sector, where products require temperature controlled transportation. Sometimes labels with adhesives, which are produced to a higher specification, are required. Most industrial chemicals are covered by the CLP regulation, though some that have a more specialised job are covered by more specific legislation. It doesn’t, for example, apply to radioactive substances and mixtures, or to mixtures for scientific research and development which aren’t placed on the market and are only used in controlled conditions. Specific groups of chemicals, which may be subject to additional control, i.e. pesticides, biocides and carcinogens, are also exempt. The more specific chemical groups do however fall within the scope of REACH, the European Union Regulation, which covers the Registration, Evaluation, Authorisation and restriction of Chemicals. REACH applies to substances manufactured or imported into the EU in quantities of 1 tonne or more per year. It concerns individual chemical substances but does not include human and veterinary medicines, food and food additives or plant protection products, polymers and biocides, which are all covered by more specific legislation such as the Biocidal Products Regulations (BPR). Since REACH covers the entire supply chain, compliance requires a collaborative effort by all involved in the chemicals transportation. Meeting the requirements of REACH can vary significantly depending on your role in the industry, as well as the product you manufacture. With an emphasis on a “no data, no market” approach, the REACH Regulations place a responsibility on industry to provide safety information on chemicals, such as how the substance can be safely used and the risk management measures that need to be put in place to avoid harm to employees. As a result supply chain management is one of the main values of REACH, with manufacturers and importers required to gather information on the properties of their speciality chemicals and register this information in a central database in the European Chemicals Agency (ECHA). This regulation has been the catalyst for improvements in the safety of workers throughout the supply chain, with many of the most dangerous chemicals – referred to as substances of very high concern (SVHC) – identified and substituted with less hazardous ones. Although companies must be aware of the changes to chemical labelling and packaging under CLP regulations and requirements of legislation such as REACH, they must also take into account the demands placed upon them when transporting hazardous chemicals by road. The carriage of dangerous goods by road involves countless hazards, whether that is the risk of a traffic accident, spillage, fire, explosion or chemical burns. The legislation surrounding such processes is complex and consulting industry experts is worthwhile. When transporting hazardous goods by road in the UK and the EU, packages and vehicles must be properly labelled to conform to the strict CDG (Carriage of Dangerous Goods) and ADR Regulations. Hazard warning labels, diamond placards, Hazchem panels and panel holders must be attached to vehicles to ensure full compliance. ADR not only serves the purpose of protecting everyone directly involved, such as the consigner or carrier, but also those who may become involved if an accident or spillage occurs, such as members of the emergency services and the public. 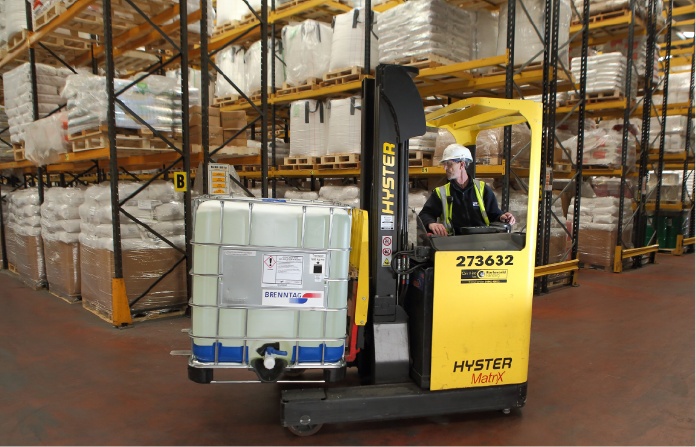 The regulations place responsibility on everyone involved in the transportation of hazardous materials, to ensure the risk of incidents is minimised and a fast and effective response can be achieved if they do occur. Supply chain management remains a key principle for achieving such regulatory compliance in the industry. Given the increasingly complex legislation surrounding the transportation of goods and the demands placed on companies to ensure compliance, expertise and experience are crucial. With the correct knowledge and training, chemical producers cannot only avoid potentially costly fines, but also guarantee the health and safety of staff. There is no ‘one size fits all’ approach when it comes to chemical labelling so a bespoke solution, using specially supplied labels or individually adapted printing software, is usually the best approach for the specialised chemicals industries. Hibiscus plc has over 30 years’ experience in chemical labelling and is a licenced provider of legal documentation to the chemical industry including dangerous goods notes, IATA forms, and standard shipping notes suitable for handwriting or laser printing. We are one of the UK’s leading manufacturers of ADR hazard warning diamonds and placards, with thousands of labels in stock, ready for next day delivery and we also produce ADR panels and holders for the transportation of hazardous materials by road. Our clients range from some of the biggest in the industry to smaller niche companies and over our 35-year history we have developed strong working relationships with many corporations across the globe. If you need assistance with any aspects of chemical labelling, or to purchase labels, call us on: 0113 242 4272. Visit our online shop Stock-Xpress for off-the-shelf hazard warning labels.